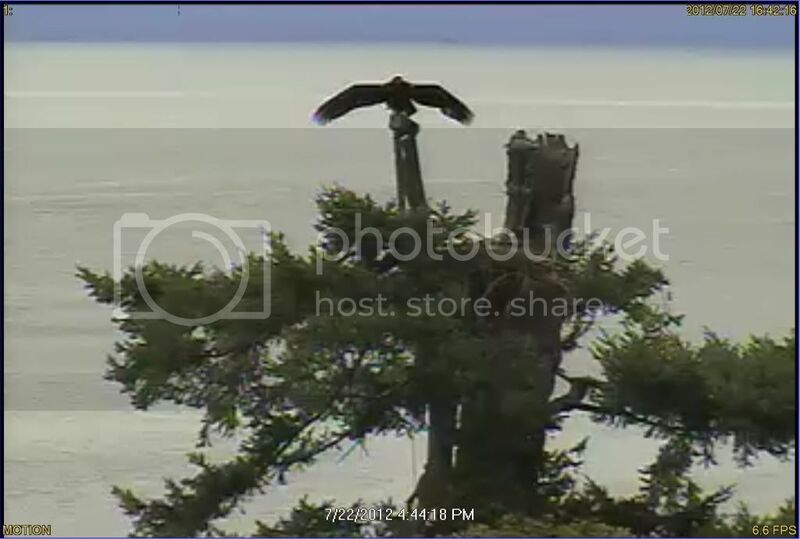 july 22 2012 08:35:02 - HALI FLEDGES FROM THE WIDE ANGLE CAMERA! Hali in the Baby sitting tree . 9.12am still there in Babysitting tree . Mum comes to nest with fish and calls softly to Hali in the baby sitting tree .. Hali screeps back at her . Hali is just not ready to go back to nest and mum leaves the nest towards the beach . Hali still in the BST screeping now and then . Hali finally returns to nest for lunch when mum once again arrives with fish . Mum goes to Close up cam . How proud she must feel of her offspring . Yet another eaglet safely raised to first flight . Halis antics on the wide angle cam after lunch . 1:14 pm Dad drops off food, Hali down and Dad gets outta there!! I had a feeling that today would be 'fledge day'. Many thanks to paintnut, sparkie and Booni for their blow by blow description and videos. Thanks to the Zoomies and all of you who captured her fledge, screeps, and flight back to the nest. Do we know the time she flew back to the nest? july 22 2012 11:45:15 - HALI RETURNS TO THE STUMP FROM THE BABYSITTING TREE! There is grace afoot in this world and it will find you.